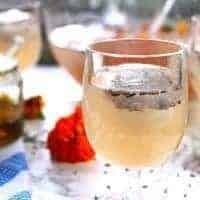 Have you ever had the pleasure of hosting a large gathering and struggled with figuring out what drinks to serve? Yeah, that happens to me a lot. I didn’t always find it a pleasure either but since I started going big-batch with party drinks, things have gotten better for me. I almost always go for a punch. 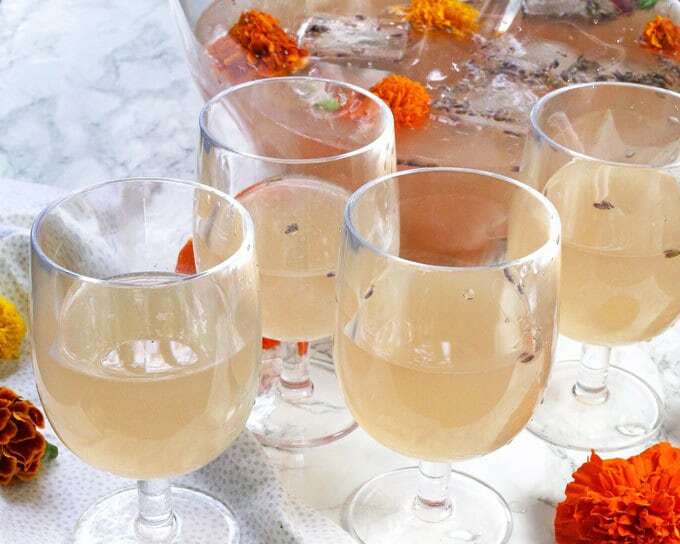 Drink-punch, not fight-punch, but boy do my big batch drinks hit the spot. 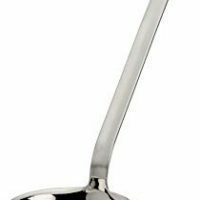 You can make a big batch of just about any drink and then do all of the other hosting things that need to be done (cook, greet, clean, etc). Two, they are DELICIOUS. 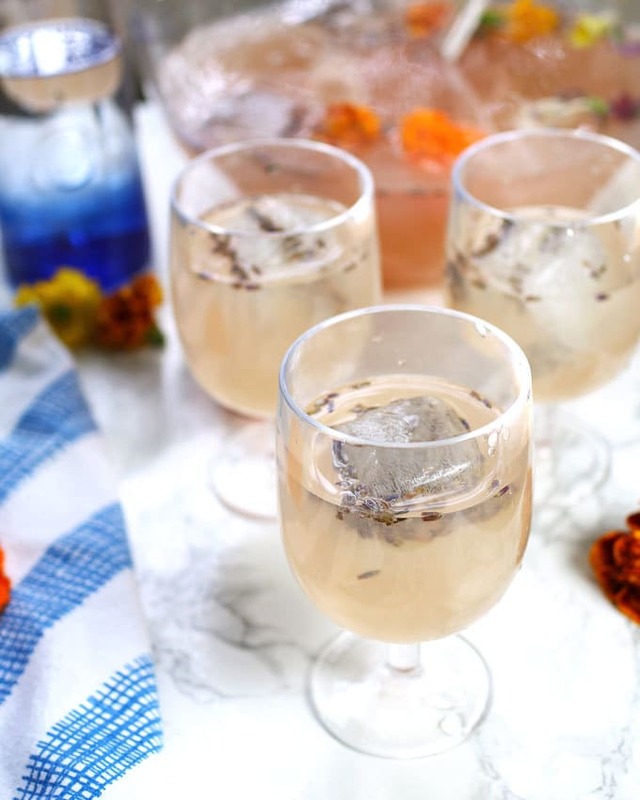 I had a blast making this boozy honey lavender lemonade. 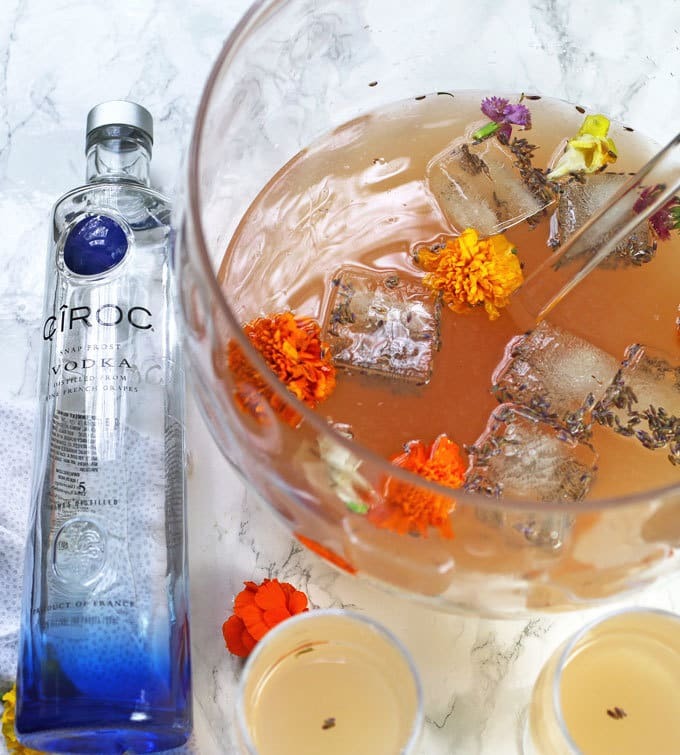 Ciroc Vodka was my spirit of choice for this punch. (Thanks for the sample!) It is distilled 5 times and made from French grapes leaving it with a clean and fresh taste. Perfect for a punch made from lavender flowers. 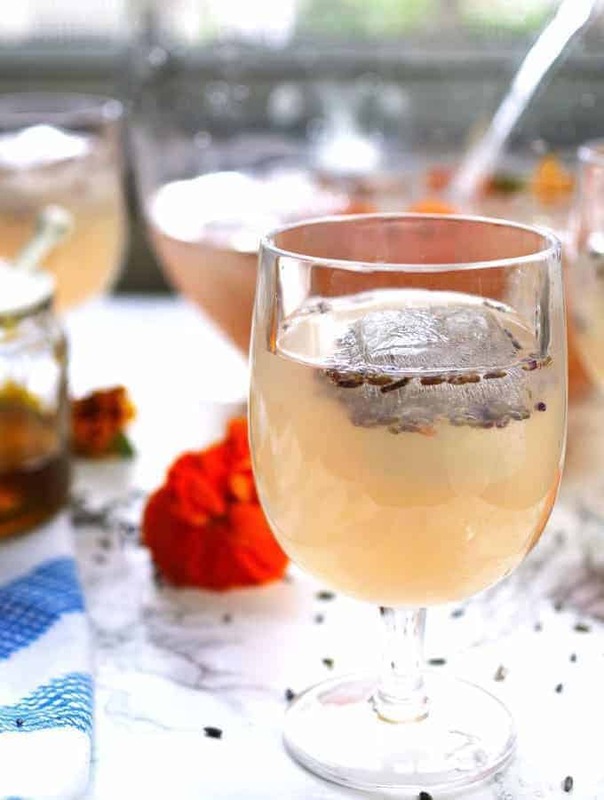 The punch itself is very easy to make – simply make the lavender honey simple syrup and combine that with lemon juice, water and vodka. 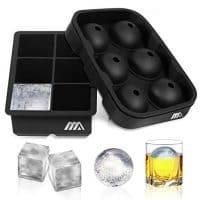 To make the lavender ice cubes, buy a large silicone ice cube tray like this one (affiliate link). Sprinkle a small amount of fresh lavender in each of the cavities and fill each cavity halfway with distilled water. Freeze this. Remove it from the freezer, add a little more lavender and top off each cube with more distilled water. Oulà! I added the finished ice cubes and some beautiful edible flowers to my punch bowl. Can’t you see this at a baby shower or bridal shower? I can. Bring water to a boil in a small pot. Once water is boiling, add lavender flowers and reduce heat. Allow to simmer for 5 minutes, then strain lavender flowers out and discard. Return lavender infused water to pot and add honey. Turn heat to medium and simmer until honey is dissolved and liquid has reduced by 1/4 cup (10-20 minutes depending on your pot.) Remove from heat and allow to cool before using. 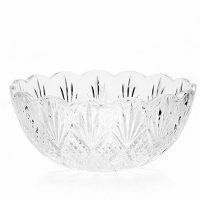 Add lemon juice, water, vodka and 1 1/2 cups of lavender honey simple syrup to a large punch bowl. Stir well. Add ice and fresh edible flowers to garnish. Disclosure: I was provided with a sample of Ciroc Vodka and a stipend for ingredients. I’ve never had lavender in a drink before, but I love it to soothe my headaches, so I bet it’s great to drink too! This looks like a great recipe! Thank you for sharing! mmm I’ve always been a fan of lavender and honey together! I it’s fantastic in this lemonade! These photos are seriously stunning! And I love the flavor combo – must try! I’ve never used lavender flower. I’ve got to try. It looks delicious! I’ll be sipping this all Summer long! Um, yes yes yes! I am also a big fan of punches at parties (Like you– the drink kind, not the fist kind). This looks so lovely! How much should the honey lavender syrup be reduced by? 10 minutes at full simmer did not reduce, 20 minutes reduced by 1/4 cup. Thanks! Thanks for the feedback Courtney! I usually let it simmer for 10 minutes and it reduces by 1/4 cup – I’m thinking that our pot sizes/widths may be different. I will update the instructions to reflect that it may take 20 minutes to reduce. Does the lavender have to be fresh or can you use dried? You can use dried – that’s what I used!